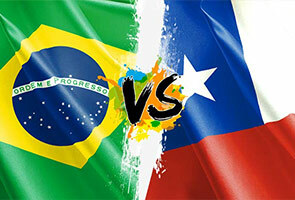 Brazil attempt to book their place in the last eight against South American rivals Chile. RIO DE JANEIRO: A Uruguay team fuelled by a sense of injustice battle Colombia for a place in the World Cup quarter-finals on Saturday as hosts Brazil attempt to book their place in the last eight against South American rivals Chile. And Tabarez warned the controversy had left his players determined to extend their stay at the World Cup by beating Colombia when the teams meet at the Maracana in Rio de Janeiro on Saturday. According to a copy of the FIFA disciplinary committee judgement seen by AFP, Suarez denied biting or attempting to bite Italy's Giorgio Chiellini. "My face made impact with the player...leaving me with severe pain in my teeth," he said. "In no way can this be described as biting or attempting to bite." FIFA rejected Suarez's defence, hitting them with the heaviest sanction ever imposed on a player at a World Cup. The panel noted in its judgement Suarez had not "any repentance, remorse, or acknowledgement" of wrongdoing. In Saturday's other last 16 game, Brazil will be attempting to edge closer to their dream of a record sixth world title when they face Chile in Belo Horizonte. Brazil coach Luiz Felipe Scolari admitted he is feeling increasingly nervous heading into the match against a talented Chile side who helped to eliminate world champions Spain in the first phase. "It is understandable that one should feel uncomfortable and anxious, especially when you get to the knockout stage. We can't afford to make a mistake," said Scolari. "There is a bit more anxiety, more nerves. But that is normal in any competition, not just because we are in Brazil. When I am on my own and I start to think, I do get a bit nervous." The tense mood ahead of the game was reflected in a war-of-words which erupted on Friday over the choice of referee for the match, England's Howard Webb. Chile star Alexis Sanchez and the head of the Chile Football Association both expressed concerns that Webb may be influenced by the partisan home crowd. But Brazilian officials hit back, angrily accusing Chile of trying to manipulate Webb, one of the most respected referees in international football who took charge of the 2010 World Cup final. "To talk about this subject is primitive and immature. Applying this kind of pressure is ridiculous," a Brazilian Football Confederation (CBF) spokesman said. "Not only is it disrespectful towards FIFA, the referee and the Brazil team with their 100-year history of winning, but it is also disrespectful towards the people of Brazil. "Brazil do not need the referee in order to win titles. The Brazilian team and people deserve more respect."